Easy to use invoice software allowing you to raise invoices, credit notes, quotes and purchase orders as well as print delivery notes. Comes with a template editor allowing you to modify the in-built templates to suit your business, eg. Adding logos and text or configuring columns. Also lets you track payments, automate monthly billing with recurring invoices and includes stock control and purchase orders. Includes stock control features helping you track stock levels and easily reorder low stock. V6 now includes support for uk hmrc s making tax digital (mtd) for vat allowing you to see your vat obligations and submit vat returns. 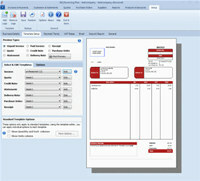 SliQ Invoicing is a business program that works under windows xp, windows vista and windows 7. It supports both 32-bit & 64-bit windows editions, therefore it could run faster on 64-bit computers. Estimated download time for SliQ Invoicing on a common adsl connection is less than a minute. Version 6.0.0 is brand new and was released eight days ago by SliQTools. Click the green download button to download it now.